The Press of Robert LoMascolo: Why use metal type in the digital age? Why use metal type in the digital age? In this age of computers, I often get asked why I still continue to cling to the use of metal type. Letterpress is old fashioned enough, why not design on the computer and have plates made people ask. First off, metal type looks infinitely better to the trained eye. Tremendous care was taken in the design and engineering of metal type faces. Unlike digital type, where a single set of letters is mathematically enlarged or reduced to any needed size, in metal type, each size was designed and modified to be both readable and attractive at that size. The result is that digital type will look awkward at large sizes, and be too heavy and difficult to read at very small sizes. The second reason is a matter of intended purpose, or intended medium. A great disservice was done to digital typography as a result of poorly thought-out digitization of many preexisting metal typefaces. Letterpress by nature adds a slight amount of swell (bulking up from the ink) and impression to the printed type. When these typefaces were designed, the designers purposely drew the type more lightly than they intended it to look. 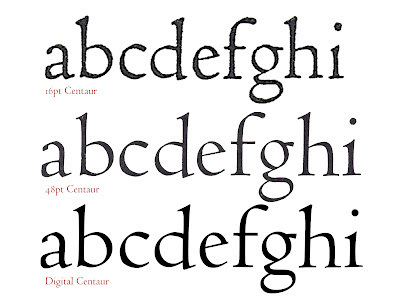 When these typefaces were digitized, the original drawings were copied exactly. When printed by LaserJet or seen on screen, these types look pale and harsh. The reverse problem happens when new digital typefaces are made into plates and printed by letterpress. The designers of these contemporary digital typefaces design the type so it looks perfect on screen. When printed letterpress, these types look too heavy, or are even blobby, as ink swell is added to places where it was never intended. Finally, metal type has a vast historical significance. With the number of people who still know how to cast type and the machinery needed to cast it dwindling rapidly, the future of metal type is uncertain. It is important to take advantage of this increasingly rare resource while it sill exists. In high end work where no expense is spared, should not the best possible type be used? Indeed it should be, and some of the very best type being cast today is being produced by The Press & Letterfoundry of Michael & Winifred Bixler, in Skaneateles, NY. Michael is one of only about two people in the country still casting type full time. 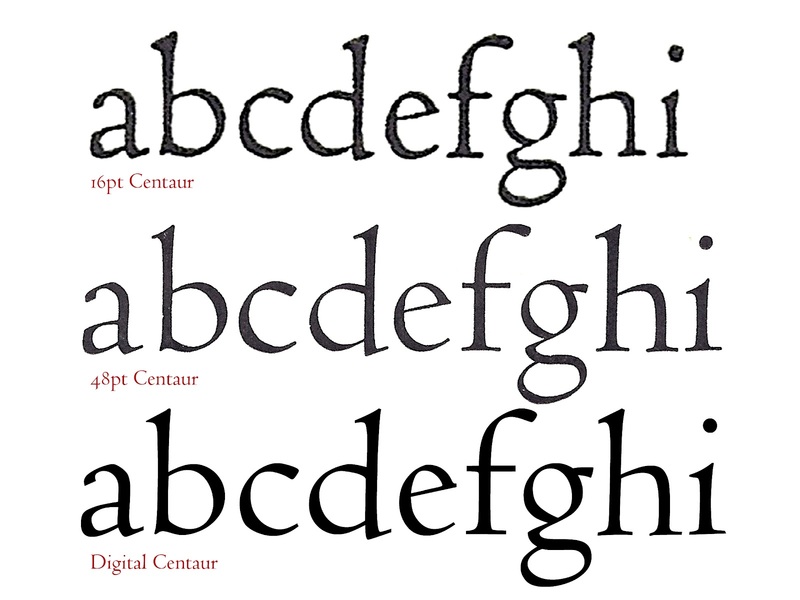 Just as all digital typefaces are not created equal, not all metal typefaces are either. 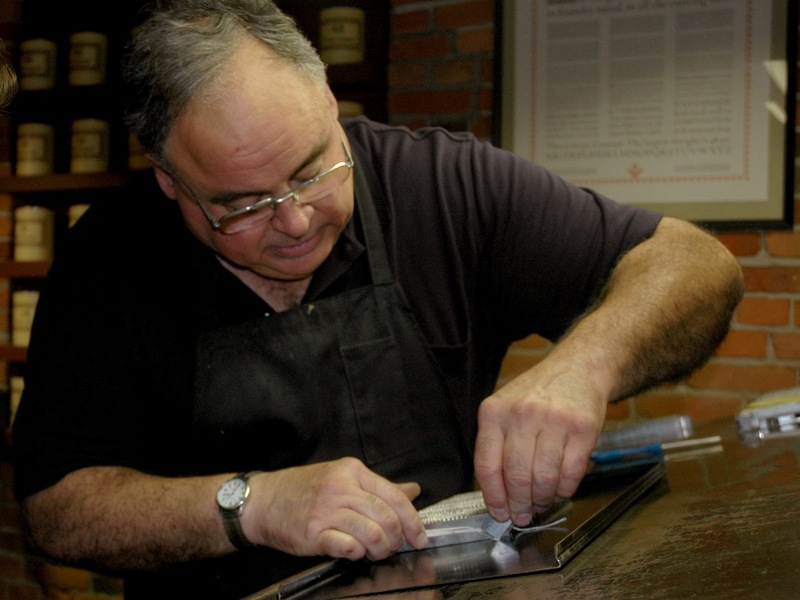 Michael and his wife Winifred specialize in casting and printing only the finest classic English Monotype typefaces. Not only did the English Monotype Corporation commission the finest designers and engineers of its day, but Michael has methodically collected and masterfully maintained the extensive and complicated equipment needed to cast it. Michael’s collection of matrices, or molds for the letter portion of a piece of type, is truly impressive. I have been extraordinarily lucky to know both Michael and Winifred personally, and I can’t think of anyone more knowledgeable, patient, and generous. Please be sure to check out the Bixler's website for a list of typefaces available for purchase. Take a listen to Michael’s short audio interview from the August 22, 2010 BBC broadcast of “Americana” below.